In this project, LDR’s are working as light detectors. Before we go into detail, we will have to understand how the LDR’s work. LDR (Light Dependent Resistor) also known as photo resistor is the light sensitive device. Its resistance decrease when the light falls on it and that’s why it is frequently used in Dark or Light Detector Circuit. Check the various circuits based on LDR here. The two LDR’s are placed at the two sides of solar panel and the Servo Motor is used to rotate the solar panel. The servo will move the solar panel towards the LDR whose resistance will be low, mean towards the LDR on which light is falling, that way it will keep following the light. And if there is same amount of light falling on both the LDR, then servo will not rotate. The servo will try to move the solar panel in the position where both LDR’s will have the same resistance means where same amount of light will fall on both the resistors and if resistance of one of the LDR will change then it rotates towards lower resistance LDR. Check the Demonstration Video at the end of this Article. First of all, take a small piece of cardboard and make a hole at one end. We will insert the screw in it to fix it with the servo later on. Now fix two small pieces of cardboard with each other in a V shape with help of glue or hot gun and place solar panel on it. Then attach the bottom side of the V shape to the other end of small piece of cardboard in which you made a hole in first step. Now insert the screw in the hole you made on card board and insert it through the hole into the servo. The screw comes with the servo motor when you buy it. Now place the servo on another piece of cardboard. The size of the cardboard should be larger enough so that you can place a Arduino Uno, a breadboard and a battery on it. Attach the LDRs on the two sides of the solar panel with the help of glue. Make sure you have soldered the wires with the legs of the LDR’s. You will have to connect these with the resistors later on. 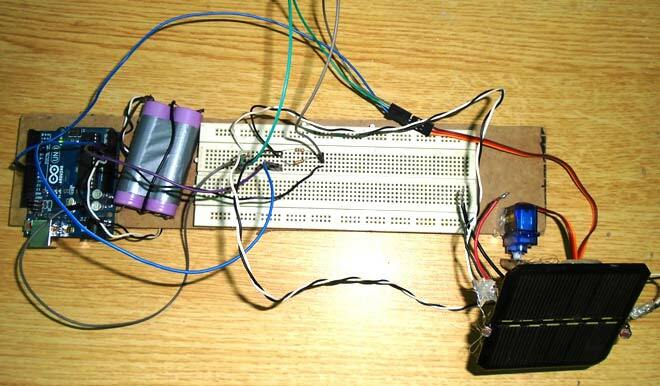 Now place the Arduino, battery and the breadboard on the cardboard and make the connection as described in the Circuit diagram and Explanation section below. The final prototype is shown below. Then we will read the values from the LDRs and will save in R1 and R2. Then we will take the difference between the two LDRs to move the servo accordingly. If the difference between them will be zero that it means that same amount of light is falling on both the LDR’s so the solar panel will not move. We have used a variable named error and its value is 5, the use of this variable is that if the difference between the two LDRs will be under 5 then the servo will not move. If we will not do this then the servo will keep on rotating. And if the difference is greater than error value (5) then servo will move the solar panel in the direction of the LDR, on which light is falling. Check the Full Code and demo Video below. What code is for 4 actuators (optional rotating vertical)? I have a solar panel of 100watts,also it is 5kg in weight so can you just help me with choosing the rating of servo motor so that it can rotate the panel. hy I'm a college student 1st year ,can u give me a clear picture of how to solder the ldrs to the solar panel? I want to make that with dc motor then what is the code with dc motor. 10K Ohm resistor but how many watt? Using a Wiper motor to control the solar pannel is a bad idea. Because wiper motor does not have position control? Why did you not use a servo? Is you panel very big for a servo?